This November celebrate a Jewish Thanksgiving with Thanksgiv-ukkah near the Olympic Park. Held on Thanksgiving night itself, and the first night of Hanukkah, Thurs 28th, it will be a combination of the two, in one delicious meal. "The Bream Team celebrate this hybrid holiday with three delicious courses of Thanksgiving - Hanukkah fusion delights at a beautiful new space in the heart of the Olympic Park. A once in a lifetime holiday collision means that Thanksgiving and the 1st night of Hanukkah fall on the same day this this year and it won't happen again for 70,000 years - celebrate with us! 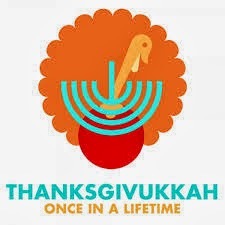 And what is Thanksgiv-ukkah food? Think sweet potato latkes with cranberry-apple sauce, pomegranate and apricot glazed turkey, challah stuffing and more! Dalston Food growing project FARM:shop will be running a bar serving up tasty seasonal cocktails alongside excellent wines and craft beer. Profits from the bar will go to the Camden Society - a fantastic charity supporting people with learning disabilities. Guests will be greeted with canapes and a seasonal cocktail."